I conducted an experiment. For the first time since I've been reading stories to my daughter, I gave her a book that she had never seen before and asked her to tell me the storyline, using the pictures as her guide. She is a preschooler and doesn't read yet, though she can recite many, many books from memory. 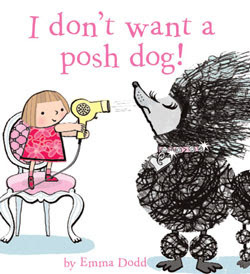 I thought the book I Don't Want a Posh Dog! written and illustrated by Emma Dodd seemed like a good candidate for my experiment, with its action filled, expressive and large illustrations. She took her time paging through the book, carefully considering each dog-filled picture. Her verdict? "The little girl is saying, 'Hmmm, What dog I want?'" Impressive! My daughter nailed the gist of the story right on the head. That shows that Emma Dodd knows how to illustrate a picture book. The illustrations show a little girl as she searches for the perfect dog all the while discussing the traits she doesn't want her dog to possess. No uppity poodles or stylish purse dogs for her and especially no mean, growling, biting dogs. She just wants to find the right dog for her. The story, told in short rhyming verses, describes multiple dogs using silly and funny adjectives like scritchy, scratchy and greedy, pleady. Many different comically illustrated dogs are pictured, and, for better or worse, the story includes some generalizations regarding certain dog breeds. Emma Dodd lives in England and has illustrated a large number of books including the "Amazing Baby" board book series. In I Don't Want a Posh Dog! her adorable illustrations show texture sometimes though the use of different mediums including an almost collage like style. This is great book for dog-loving preschoolers, and is especially appropriate for families that are planning to search for the perfect family dog. (Cat lovers should check out Dodd's I Don't Want a Cool Cat ). That looks like a fun book. I will have to check it out at the library! We actually just borrowed this book from the library last week, so it's funny to see it reviewed here now!! My 3 year old daughter loves it.